Also known as: USB splitter and hub, built-in hub, USB hub, peripheral device hub and splitter, keyboard monitor mouse splitter, USB keyboard splitter, reverse KVM switch. 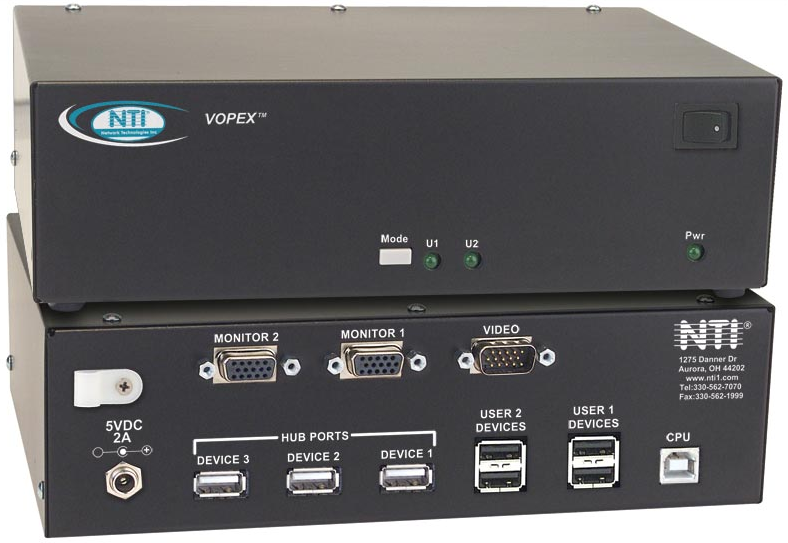 The VOPEX® VGA USB KVM Splitter with built-in USB hub allows up to four users (four USB keyboards, USB mice and VGA monitors) to access one USB computer (PC, SUN, MAC) and up to three USB devices (printers, scanners, security cameras, etc). 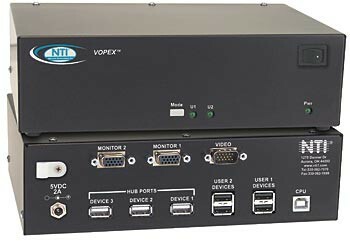 The VOPEX-USBV-2 USB KVM splitter with built-in USB hub allows two users with USB touchscreen monitors, USB keyboards, and USB mice to access one USB-enabled computer and one USB device (printer, scanner, security camera, etc.). Connect the USB touch screen monitor into one of the USB hub ports and into one of the VGA monitor output ports of the splitter.